1.The plants killer?Always forget to water your plants?Still have to get all of the dirt out that stick inside the bottom ? With this stick spikes,dirt would never inside the watering pot forever. This plant watering device will makes you excited. 2.Compare with easy break terracotta drippers，this dripper made out of high quality ABS matirial,works much better and last for long time. 3.Make the soil stays evenly hydrated! No more too much water OR too LITTLE water! It just right! 4.Arrived in perfect shape,well protected package with original box,include Installion Step and User maunal. 5.It would be your best choice for your house plants and herbs watered while on vocation. 6.Great gift for: Mother's Day, Father's Day, Birthday, Boss, Bridesmaids, or just because, for anyone who loves their plants. GOOD IDEA LAZY PERSON - Adjust the speed of water according to your own needs .Automatic watering systerm, you don't have to worry about that no one take care of your plant when you away from home for a long time. ADVANCED DESIGN - Plant Watering Spike High strength and toughness, good heat and cold resistance, safe and non-toxic. Long mouth cone design to easily get straight to the root. 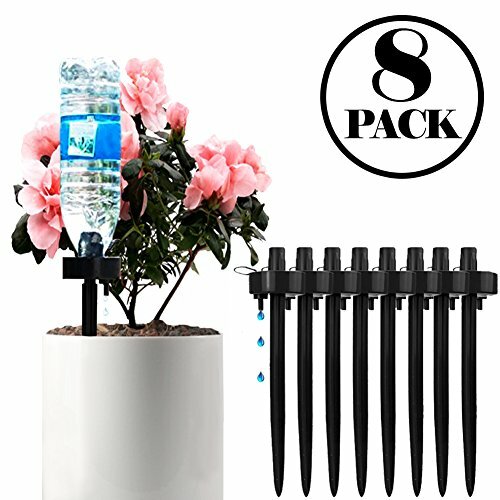 EASY TO USE - Plant watering device, provide water straight to the plants roots,suitable for most plants.Easy flow control means your plants receive the correct amount of water..We just only fill with water in plastic bottle and insert into soil.By observing the plastic bottles, we can know how much water, whether you need to add water.A good helper for plant growing.